조선전기에 만들어진 백자병으로 높이 21.4㎝, 입지름 4.9㎝, 밑지름 7.2㎝이다. 아가리 가장자리가 밖으로 벌어져 있으며 목이 긴 백자병이다. 목과 어깨 그리고 몸체에 각각 2줄의 선을 두르고 목과 어깨 사이에는 파초잎을 그렸으며, 어깨와 몸통 앞뒤로는 매화와 국화무늬를 옆으로 길게 그렸다. 파초무늬는 형식적이나 매화와 국화무늬는 사실적이다. 우리나라에서는 고려시대 도자기에 이미 진사를 사용하기 시작했으나, 조선시대 전기에는 도자기에 붉은색을 냈다는 사실만이 전해지고 있을 뿐이며 후기에 이르러서야 본격적으로 사용되고 있다. 이 작품은 조선 전기에 진사로 무늬를 그린 병으로 그 가치가 크다고 하겠다. 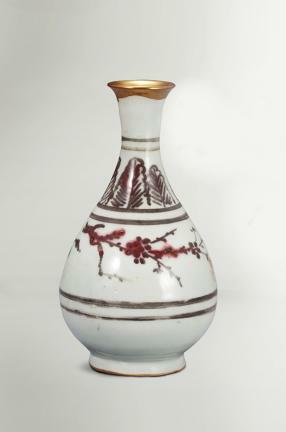 This white porcelain bottle of the early Joseon Dynasty is painted with the so-called jinsa method, a traditional way of painting a picture with red pigment. It is 21.4cm tall with a 4.9cm wide mouth and 7.2cm wide bottom. It has a round body and a relatively long neck with an everted mouth rim. Pairs of horizontal lines go around the neck, shoulder and body of the bottle. Plantain leaves are painted between the neck and shoulder. Plum flower and chrysanthemum patterns are painted long and horizontally between the shoulder and body on the front and rear of the bottle. The plantain leaves are stylized but the patterns of plum flowers and chrysanthemum are realistic. 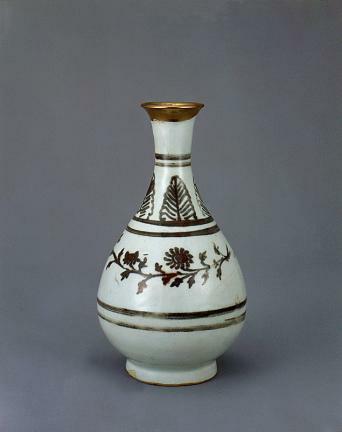 Among the jinsa-style celadon and white porcelain potteries, this bottle is the only white porcelain pot of the 15th century that was unearthed.